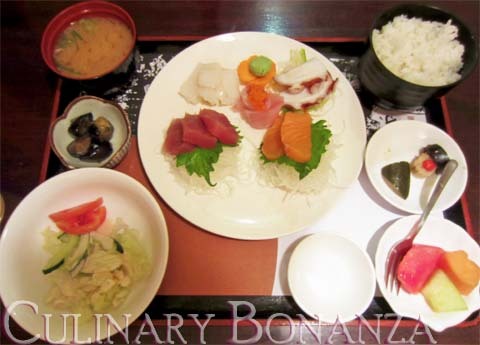 Sakana Japanese Restaurant is located at the basement level of Mid Plaza 1 building. When I visited it on a Sunday, the complex was practically deserted, something that I'd imagine to be totally different from the weekdays situation when it is alive and bustling with office executives. As I walked past the dark wooden corridor at the entrance, I thought the restaurant was not operational, that's when I was approached by a uniformed staff wearing white shirt and black skirt. The inside was far from my imagination at all, instead of an open space with visible tables and tatamis, I was greeted by a dim maze of wooden panels. 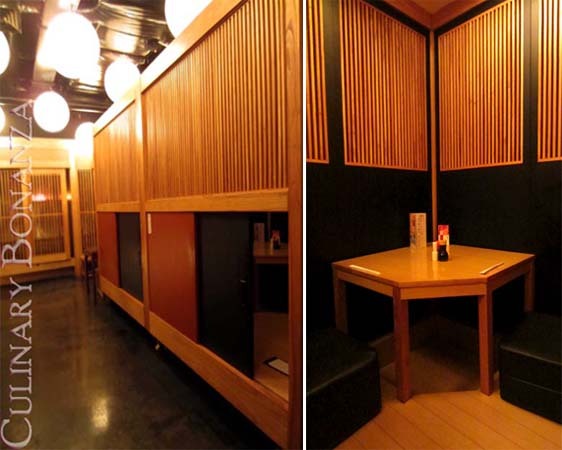 As I walked past I saw cubicles with different sizes of doors, I saw that each of them could accommodate from 2 to more diners, some have chairs, some have elevated wooden floor and tatamis to sit on. I found the smaller cubicles rather claustrophobic, so I chose one that can accommodate 4 (even though there are only 2 of us). The downside about sitting in cubicles like this is you can't call the staff for assistance easily, unless they happen to be walking past your cubicle. 2PM was a tad late for lunch time, when we fixed the meeting time. As it was approaching the kitchen break between lunch and dinner time, the staff hurried us to make our orders. Uhhh, okayyy....So I ordered a Karatan Men Set & my friend, a Sashimi Mori Set. Both our sets are supposed to come with a dessert, which turned out to be 3 meagre bite-sized slices of fruits. Nothing fancy like ogura soup or matcha ice cream. Ah, disappointment! But for the price of the whole set, I think it was quite a good deal. You don't actually need to order any drinks, because the miso soup would be enough to quench your thirst. Nevertheless, I actually got myself a glass of Shochu Cocktail Coffee. 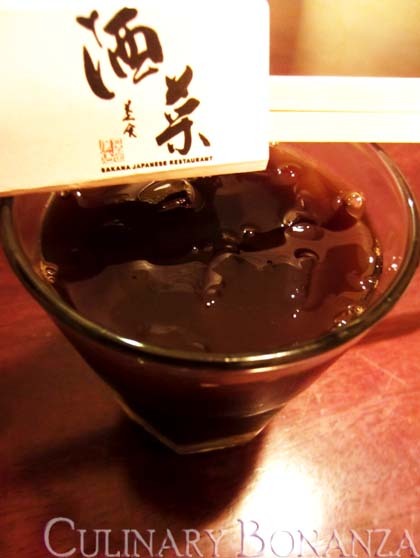 The shochu was pretty strong and it was black coffee, so I had to request for liquid sugar to make it more palatable. The food was passable, I didn't try the sashimi mori set, but he said is tasted alright. Too bad our experience eating here for the first time had to be interrupted every now and then because the staff was badgering us to close our bill and deliver it to our table before our food was even half-finished! I won't recommend visiting Sakana on weekends, but for lunch on weekdays, this could be an option for people working around the Mid Plaza area. PS: The drinks and food menu were only 2 pages long and mostly were sets. I don't know if this is the case as well on weekdays and for dinner. But the options are pretty limited here. I think the interior isn't that horrible, since they're basically made to look like izakaya, with the really cramped room and small cashier design. their takoyaki is very good and i think it's the "it" menu of sakana. in fact, i read it somewhere that sakana's takoyaki is probably one of the best in jakarta. their options are limited because they are izakaya-based "restaurant" and you'll find japanese men when evening-night starts kicking in. I went to this place for "light dinner" last time and the place was full of japanese middle aged men smoking, chatting while drinking sake, etc. this isn't the place for "fill your belly 100%" treat, in my opinion...it's just a good old place for some chit chats while having light bites. ah, just some thoughts to share there.